NEW YORK (AP) Lonzo Ball was having a dazzling stretch, every basket bringing his father farther and farther off his courtside seat for an emphatic celebration. By the end, the New York Knicks were the ones celebrating. 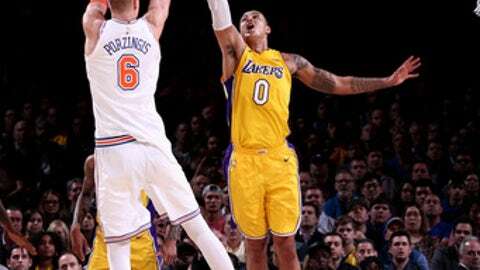 Kristaps Porzingis had 37 points and 11 rebounds, Michael Beasley made the biggest plays in overtime, and the Knicks beat the Los Angeles Lakers 113-109 on Tuesday night. Beasley finished with 13 points, including the tiebreaking follow shot, and had an assist in the extra period as the Knicks went back over .500 at 14-13. Thirteen of their victories have come at Madison Square Garden. Rookie Frank Ntilikina went the whole fourth quarter and overtime in a strong defensive effort that helped slow down Ball after his third-quarter flurry. Ball had 17 points, eight rebounds and six assists, but had just two points after the third quarter. Ball went high to slam down a lob pass from Kentavious Caldwell-Pope, nailed a 3-pointer, drove for a layup, and then fed Brook Lopez for a 3-pointer in the third, with LaVar Ball jumping up with arms waving from his sideline seat next to Lithuania-bound sons LiAngelo and LaMelo. The Knicks essentially won it with Beasley’s stretch of a tip-in, a pass inside to Doug McDermott for a basket, and a driving layup that turned a 103-all game into a 109-103 lead with 1:24 remaining in the overtime. Caldwell-Pope scored 24 points for the Lakers, who had won two in a row on their trip. Rookie Kyle Kuzma added 19 points off the bench. The Knicks were in good shape when Porzingis’ basket made it 99-94 with 1:29 remaining in regulation and Ball threw away a pass. But Caldwell-Pope tipped in a miss and Kuzma made a 3-pointer to tie it with 23.9 seconds to go, before Porzingis missed a 3 at the buzzer. Lakers: Brandon Ingram missed his first 10 shots before a three-point play with 40 seconds left that made it 79-76 heading to the fourth. Ingram finished with five points on 2-for-12 shooting. He entered as the Lakers’ leading scorer and averaged 19.2 points in the previous 11 games, scoring in double digits in all of them. Knicks: Former Knicks forward Amare Stoudemire was at the game and led a countdown to the lighting of a menorah on the overhead videoboard to celebrate the start of Hanukkah. It was the seventh anniversary of Stoudemire setting a franchise record with his eighth straight 30-point game. Walton, who played for Phil Jackson with the Lakers, said he still talks to his former coach. He was asked his feelings about Jackson’s departure in June after three seasons as Knicks president. The Lakers are about to enter one of the toughest stretches of the season for an NBA team. They visit LeBron James and Cleveland on Thursday, return home to host the defending champion Warriors on Monday, welcome NBA-leading Houston on Dec. 20, and visit Golden State on Dec. 22. Lakers: Visit Cleveland on Thursday. Knicks: Visit Brooklyn on Thursday.